May is a month of nostalgia. When I think of May, pictures of last hoorahs dance in my head. It seems that the fifth month marks the ends of eras. Class parties, prom, countdowns—they all add up to the same sentiment: Savor the sweetness; it’s fleeting. I remember before graduating from college needing one last night on Frat Row, one last dance at the dive country music bar in our sleepy college town, and one last night talking until dawn with my best girls. Change was coming. I felt its pull, and so I held just a little tighter to what I had. There comes a moment in most every friendship when we face a very real truth. There is no lasting guarantee – even for the ones you pinky promised on the playground. Because “nothing will change” is about as safe a bet as not planning on mud at Jazz Fest. Life’s gonna get messy. There’s that old adage, “you are the company you keep.” But I think it goes beyond the obvious. Friends are defining. Whether they are the best influence or toxic, they represent a phase in our lives. However, phases fade, and with them the faces who lived in that moment beside us. As our identity changes, so does our company. We all grow at different speeds and on different paths, and because of that, we outgrow friendships. Maybe we need to focus on a law degree while our friends are still pre-gaming before Ladies Nights? Maybe we’re decorating a nursery while our friends plan a Caribbean cruise? Or we’re starting a business while our friends are professionally set, or maybe we’ve realized that we’re just not cut out for the PTA like the other moms. No one’s path is more deserving than the other, but they move in different directions and move farther apart. It is inevitable. It’s what you feared during all of those lasts in May. You just didn’t want to warn your heart. There’s an anatomy to friendship. It’s structured through common interests, shared laughs, or unlikely situations that pair two people together, and the silliness blossoms from there. Before you know it, you’ve found a soul mate—both the “she” to your “nanigans” and the one with whom you can sit in total silence without a whisper of awkwardness. But the anatomy of a friendship needs more. Your self-discovery is vital. It’s requirement for the evolution of you. Sometimes that means absence. As you give in to what’s calling you, friendships fizzle. They become like old boyfriends or girlfriends. You acknowledge they existed, but everything is just weird. At one time these friends knew your secrets, your desires, but now you’re a different person. Part of you wants to show your newness, and the other part thinks it’s easier to pretend you two never existed; only that’s like running from yourself because once upon a time, these friends were part of you. Above all, the strongest friendships are those built with room for us to be who we are meant to be. Maybe there’s a drift? Maybe not? Regardless, you find you still need each other, just in different ways. Recently, I experienced another anatomy of friendship. How time lapses can literally evaporate when a connection is strong enough. I have a gravely ill sorority sister. It all happened rapidly. One moment she was celebrating a birthday milestone with her best friends on a girls’ trip, and the next moment she was fighting for her life. The shock that one of our own could be so fragile was a call to action. We pulled every resource we had—money, time, prayers—in urgency to fight for our old friend. I’ve said it before: the last place you want to be in an argument is in a sorority house. Hell hath no fury like sorority drama. However, no group rallies quite like a sorority either. That bond sticks and almost twenty years later, sisters who have not seen our friend since those last nights in their last May of college are among the first to step up and give. It’s painfully beautiful to study the anatomy of friendship. Bittersweet but true, the joy is nothing compared to the sorrow because in the depths of sorrow we rise to the occasion. We meet our friends exactly where they are, hold them up, and make true of our promise. Time, distance, change, and old arguments melt away. The only thing we dredge up is the spark that ignited the friendship in the first place. I know enough to know that not every friendship will last beyond the lasts of May. Growing apart is the chance we take the instant we allow anyone into our life. That’s what’s guaranteed. What’s not guaranteed is how we remember our friendships. They were a part of our evolution. Our anatomy. Forgetting is like dishonoring the journey. 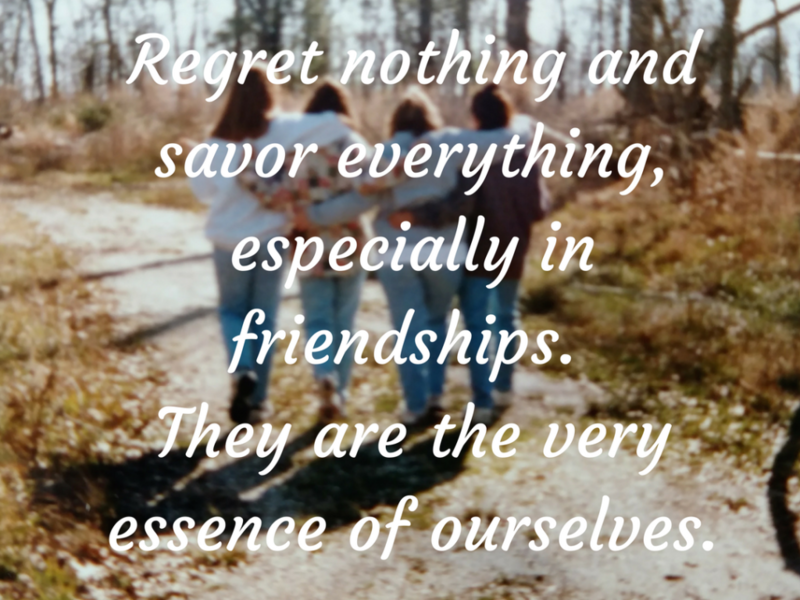 Regret nothing and savor everything, especially in friendships. They are the very essence of ourselves.